This product has a tamper-evident foil pouch. Do not use if foil pouch is punctured! Store in a cool, dry location. May refrigerate if desired. Contains no sugar, salt, yeast, wheat, gluten, corn, dairy products, artificial coloring, artificial flavoring, or preservatives. 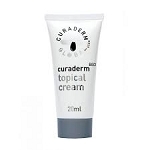 This product contains natural ingredients; color variations are normal. Acidophilus Pearls™ Start Alive and Stay Alive! 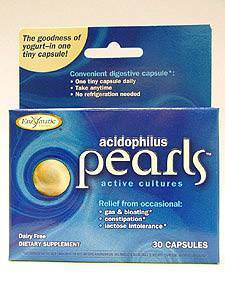 Lab tests prove Acidophilus Pearls beat 4 other leading brands in delivering live cultures. 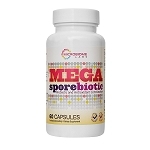 Studies show patented Acidophilus Pearls deliver up to 900% more intact microflora to the intestine in relation to label claim than 4 leading competitors, including those with enteric coatings. Palm oil, gelatin, vegetable glycerin, soy lecithin, and pectin. 16 points will be rewarded to you when you buy this item. Earn free products. Click on the green "i" for more information on our rewards program.